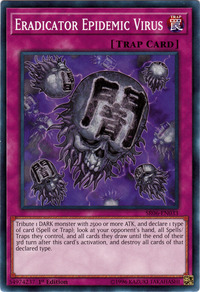 Tribute 1 DARK monster with 2500 or more ATK, and declare 1 type of card (Spell or Trap); look at your opponent's hand, all Spells/Traps they control, and all cards they draw until the end of their 3rd turn after this card's activation, and destroy all cards of that type. This card has four counterparts: Crush Card Virus, Deck Devastation Virus, Full Force Virus, and Grinning Grave Virus. Eradicator Epidemic continues as the third virus-themed card which alphabetical alteration patterns E.
The kanji 闇 on each of the viruses in this card's artwork means darkness. On the Italian Force of the Breaker printed card, the turn count is misprinted as 38. 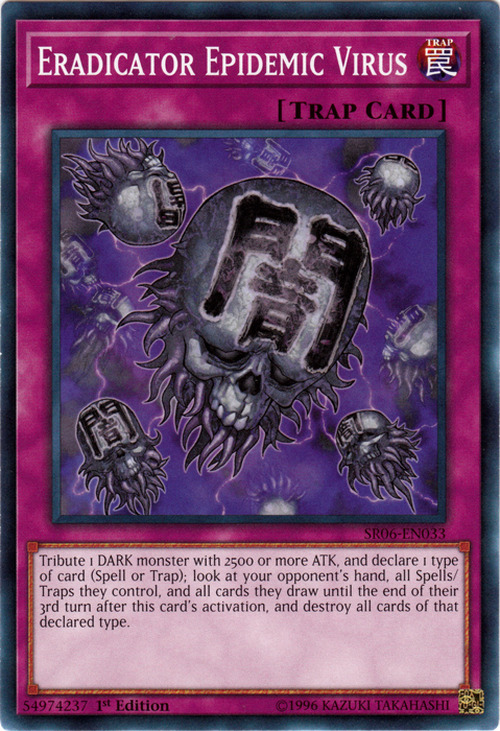 The Japanese name of Prometheus, King of the Shadows refers to this card. You must choose Spell Cards or Trap Cards when you activate this card. Any card treated as a Spell Card (a monster equipped to "Relinquished", etc.) when this card resolves will be destroyed. If you choose Trap Cards when you activate this card, and the only face-down card in your opponent's Spell & Trap Card Zones is "Fake Trap", they cannot activate "Fake Trap".